Campaigners have marched to Downing Street demanding that no other child should suffer the fate of Baby P.
They handed in a petition, said to contain 20,000 signatures, calling for "urgent far-reaching changes" in child protection laws and social services. The 17-month-old boy died from multiple injuries in Haringey, London, despite being seen by professionals 60 times. 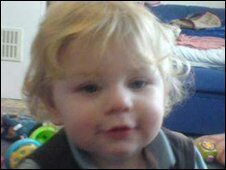 The boy's mother, her boyfriend and lodger Jason Owen are awaiting sentence for causing or allowing his death. Police said about 300 people took part in the march. One of its organisers, Stacey Crisp, 21, from Harlow, Essex, said: "We are handing in a petition calling for a public inquiry into the system and for tougher sentences for child abusers. "We have asked for all professionals involved to be sacked without pay and urgent far reaching changes to the child protection system. We want justice for this baby and for all the children out there that are being let down by these professionals." Marchers moved from Millbank, in central London, to Downing Street and Trafalgar Square, where speeches were given and prayers held in memory of the child. 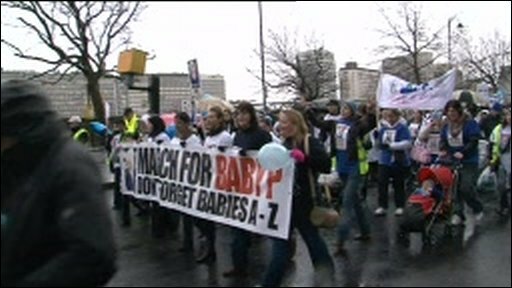 Many wore T-shirts with Baby P's face on them and carried banners with the words: "The Nation's Angel" and "March For Baby P - Don't forget Babies A-Z". Another organiser, Antonia Price, 34, from Basildon, Essex, said she felt there were "lots of unanswered questions" about the case. "I think there is a lot more to this case than we have been allowed to know and there are still a lot more people that need to answer for what happened to Baby P," she said. The campaign group was formed by 11 mothers and other women from all over the UK via a social-networking website. Its web page states: "Let's make the people that could have saved him accountable for their gross neglect." Baby P suffered more than 50 injuries over eight months, despite being on the Haringey Child Protection Register and being visited 60 times by social workers, police and medical professionals. Government inspectors identified a string of "serious concerns" about Haringey Council's child protection services, which they described as "inadequate". The council's head of children's services, Sharon Shoesmith, was sacked on Monday. She was replaced by Peter Lewis, a senior council manager currently at Enfield.